In a ‘special investigation’ this week The Irish News has rehashed the claim made by Richard O’Rawe in 2005 that a deal was on offer from the British government to resolve the 1981 Hunger Strike and that this alleged deal was scuppered by the leadership of the Republican Movement. Even though O’Rawe’s claim was comprehensively refuted by republican ex-prisoners, The Irish News has revived the allegation, partly to sell newspapers through stirring up controversy on an issue of such huge interest and deep emotion and partly to attempt to discredit Sinn Féin. To create a new ‘angle’ to the story The Irish News went to former Fine Gael Taoiseach Garret FitzGerald who claimed he ‘believed’ that there was such a deal and that the IRA blocked it. This from a politician who has been vehemently opposed to republicans throughout his career and whose main concern, as he still makes clear, was not the hunger strikers but the fact that the British government was talking to republicans. “Nothing could be further from the truth. 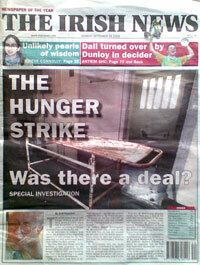 According to our critics, the hunger strikers, on whose behalf we were acting, should have accepted an ‘offer’ which came to the prisoners and us, via a phone-call from a British official in London, through the intermediary (since identified as Brendan Duddy – an honourable man), to myself, to a phone-call to Gerry Adams, and in a verbal message to Danny Morrison to the prisoners. Clearly, they have chosen to forget of what mettle the hunger strikers were made, of their experiences of British deceit in December 1980. Sinn Féin had political and ideological differences with the Irish Commission for Justice and Peace (ICJP). “We and the prisoners suspected that it would sell the prisoners short. Despite being a vehicle for the British government delivering a compromise and avoiding direct negotiations, even the ICJP’s expectations/demands that the British would send in someone to stand over what London was implying in messages was refused six times in the hours before Joe McDonnell died. “This year the British government selectively released documents about this period under the Freedom of Information Act and our critics have seized upon their release, but not their content, as some sort of proof. “Trying to ‘answer’ the claim is a bit like trying to convince an alcoholic that they’d be much better off not taking that next drink. There will never be an answer that will suffice, a response that will be adequate. “So why bother? For the families of the six who died later that summer and for the thousands of ordinary people who did so much for us during that period. “The Tory government of Maggie Thatcher is infamous for the trail of suffering, death, social upheaval, destruction of communities, and removal of civil and workers’ rights that it wreaked not just in Ireland but in Britain itself. But let’s just suppose for a moment that it wanted to end the Hunger Strike. Britain acts only in Britain’s interest so if it was decided that it was in their best interest to concede some or all of our demands it would not have been out of some humanitarian sentiment but because not to do so would be damaging to Britain’s long-term interests. “So, this Tory cabinet of Maggie Thatcher, having decided that it was in Britain’s best interest to act to break the Hunger Strike, comes up with a list of concessions they are prepared to make, presents this to the leadership of the Republican Movement, who supposedly reject them and what do the Brits do? They walk away with their tails between their legs. “Is this the same government that cold-bloodedly slaughtered the Argentinean sailors on the Belgrano? That smashed the powerful National Union of Mineworkers and left whole mining villages and communities desolate? “If the British had thought it was in their interest to end the Hunger Strike then they would have done so regardless of what the Republican Movement did or did not do. They would simply have gone to the media – having first confided with and secured the support of the SDLP, the Catholic hierarchy and the Dublin government – and announced concessions they were prepared to make. We on hunger strike would then have been faced with either calling it off or trying to continue with a now deeply divided support base, not to mention internal and family divisions. It’s not rocket science. “What we know for definite is that during the Hunger Strike there were always offers from the British but never a deal. And given that four comrades had already died and the hunger strike of 1980 had ended with not the merest crumb of concession there was no way we were ending ours without a concrete, copper-fastened deal witnessed by guarantors who could stand over it. And anyone who was on it or involved with it, including Richard, knows that to be the case. Such was our suspicion and distrust of the British.